Is your business DNA changing? The transformation of a business and its processes is always a challenge, and like anything else over time, process management and the flow of work has evolved. It’s a balance between cost and benefit, pain and efficiency. And every business has a complete and total mix of how they get work done. Paper is still ubiquitous in the business world, as are what I call “Franken-processes”, or those that are a combination of paper, Excel, email correspondence and anything else that might be at hand. Many drive their critical processes with custom applications, and the lucky ones have fully evolved, and implemented app platforms to drive speed and flexibility. In this post, I will provide an analysis of the 3 key process solutions: Paper, Custom Apps and App Platform. So, as a primer, every process can be evaluated on 4 key axes: Degree of Automation, Scalability, Flexibility and Speed to Implement. Below is a quick overview of the evolution of business process. 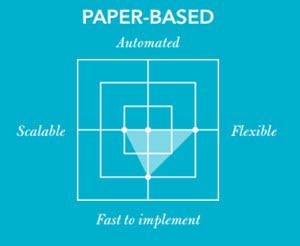 Paper processes have been part of business process forever, and it is still a pervasive medium for transactions and the flow of work. Paper forms and documents flow through businesses every day, exchanging hands, passing through in boxes and out boxes, being copied, placed in folders, and ultimately ending up in a file cabinet as a permanent record. To evaluate paper on our 4 axes, it is quite fast to implement, and can be somewhat flexible. Just create a form in Word or Excel, kill some trees through the printing/copying process and distribute. But we all know that processing paper is painful, and about as far from automated as you can get. Many organizations attempt to add automation to the mix through scanning and capture, but layering of processes just creates complexity, and decreases the ability to scale. See the chart above for a visual representation of paper process, the lowest on the evolutionary chain. For many organizations, the only option, or next step in the evolution of process is the custom-built application, focused on automating a core set of processes critical to the business. 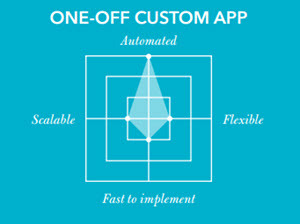 Custom apps can be a powerful technical transformation tool, and although the benefits can be huge, there are some key draw backs. Using our axes, you can see the prime benefit is automation (as shown above). But due to the long cycle times for development and updates, plus the requirement to grow and expand features overtime, custom apps can be a core constrictor on flexibility and adaptability. In this day and age, custom apps and all their draw backs are becoming and unacceptable way to automate business and drive process, and are just far too costly. Evolution in and of itself, is a process of growth, formation and change based on environmental factors, and the current apex in business process technology is the Business Process Application (BPA) platform. 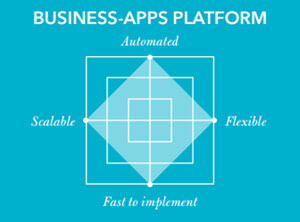 Built for speed, automation and flexibility, the BPA platform provides a broad reach on all the axes of evaluation (as shown above), and allows agility through a no/low code foundation.